Members of AFM Local 47 are high-level studio musicians, signed to major and indie labels, work on major motion pictures and television, tour throughout the world, and are members of premiere orchestras and symphonies including the LA Philharmonic, LA Opera, Pasadena Symphony, Hollywood Bowl Orchestra and more. Members are arrangers, composers, producers, contractors, engineers, and freelance musicians, regarded as some of the best in the world. There is no fee to post an audition notice in Overture Magazine & Overture Online for orchestras that have a current CBA with Local 47. For orchestras outside of Local 47’s jurisdiction offering union employment, the fee is $100 per issue. Submission deadline: 15th of the month preceding issue date. Submit Audition Notices to advertising@afm47.org. 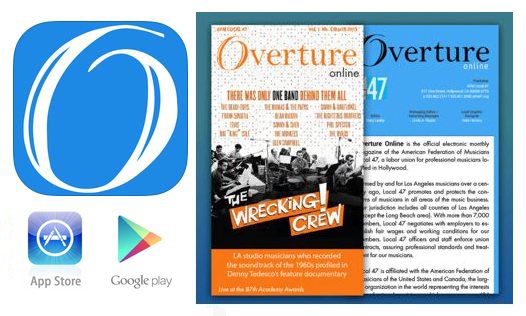 Our award-winning digital app & emagazine, Overture Online, is published the 1st of each month. The app is available for free download on smartphones and tablets from the Apple App Store & Google Play. While optimized for viewing as an app, readers without smart devices can also access our emagazine on any web browser (flash required). Browse the web archives. All digital ads run one full-page and measure 900px W x 1200px H (minimum 72 dpi). Click here for information about advertising in our annual Member Directory. Our award-winning Overture Magazine, redesigned as a color magazine in Spring 2015, is mailed to the homes of our more than 7,000 members every January, April, July and October. 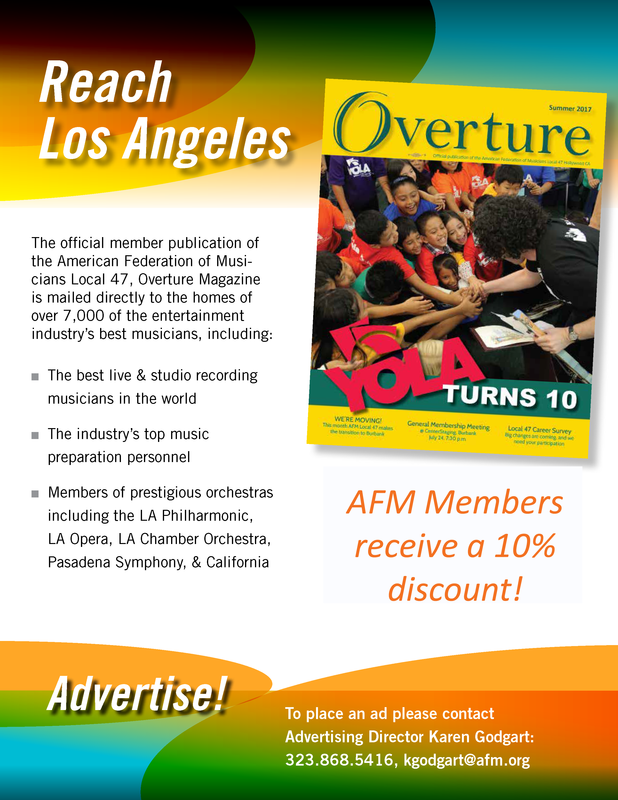 Learn more about Overture Magazine. 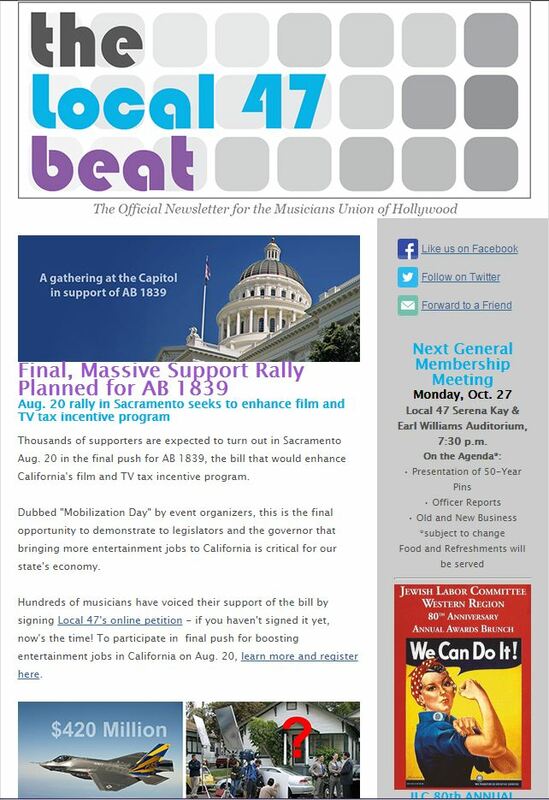 Our award-winning email newsletter, The Local 47 Beat, is delivered to our members' inboxes every other Friday to announce the latest news in music, entertainment, and the labor movement. View recent issues of The Local 47 Beat here. View ad specs & reserve your next Beat ad here. If you have already booked your ad, you may submit payment here. * DISCLAIMER: To place an ad promoting a musical recording or concert/musical event, there must be an AFM contract associated with the recording or performance, which must be verified prior to ad placement. All advertisements are subject to acceptance by the publisher. The publisher will not accept advertisements that are illegal, defamatory, or an infringement on a third party's rights. The publisher has the right to refuse or edit any ad copy deemed inappropriate or offensive.